David Solway's launch of his new Freedom Press book "The Boxthorn Tree"
"David Solway's high-octane writing snaps, crackles, and pops with savage but disciplined indignation." National officials, press barons, journalists, Internetians, "Human Rights" agencies, public intellectuals and a growing segment of the vox populi are tapping increasingly into the poisoned aquifer of anti-Jewish and anti-Zionist feeling. Yet what is perhaps even more disconcerting is the comparable attitude of many in the Jewish community today, mainly of the Left, who have made common cause with their enemies, defamers and traducers. There is not much question that what we are observing is a pathology of the first magnitude, what the Talmudic sages called sin'at akhim, or brotherly hatred, an element of Jewish life sufficiently pronounced to merit a name of its own. This book redresses the cowardly rise of Jewish self-hatred. David Solway's work has appeared in journals and magazines such as The Atlantic Monthly; The Sewanee Review; PN Review (U.K.); Descant; Partisan Review; liberté; International Journal of Applied Semiotics; Policy Options: Institute on Research in Public Policy; and Journal of Modern Greek Studies. He is currently a regular contributor to FrontPage Magazine, Pajamas Media and Academic Questions in the U.S.
"In The Boxthorne Tree, David Solway has assembled a veritable fusillade of inquiring, incisive, and supremely intelligent observations about the current state of play in the Middle East. He offers a salubrious alternative to the usual anti-Israeli static emanating from the mainstream media and its enablers in academia in prose that is as scintillating as it is well informed. This will be essential reading for anyone interested in what is actually happening in that perennially troubled hot spot." 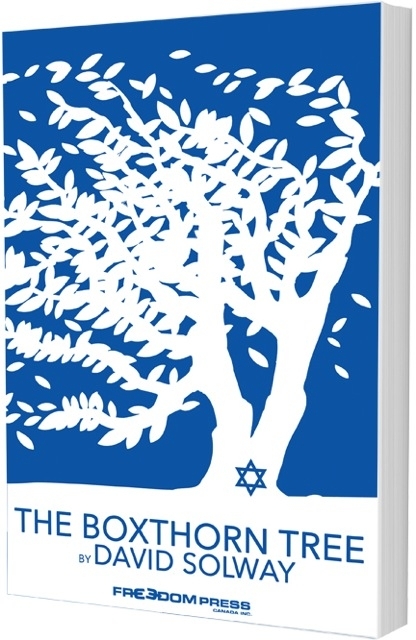 "David Solway's incisive, erudite essays on Israel, the Jews, and the difficult world they have to confront make for arresting, indispensable reading. For me each Solway essay in this subject area is an event requiring, and rewarding, one's full attention." "David Solway's high-octane writing snaps, crackles, and pops with savage but disciplined indignation. An omnivorous researcher, rooting out polemical truffles from ancient religious texts, eminent historians, presidential speeches, imams' sermons, academic treatises, today's newspapers, and yesterday's blog posts with unflagging curiosity and a knack for artful synthesis, Solway's intellectual and rhetorical command of today's most pressing issues have no equal." "An accomplished poet, whose elegant prose reflects that exacting craft, David Solway is the most sublime, vanishingly rare of non-fiction writers-a conscientious, inquisitive Truth-teller. With his gimlet eye, which eschews all cultural relativist pandering, Solway boldly disentangles the predicament of Israel, and Jews in general, from the web of falsehoods woven by jihadists of all ilks, abetted by their distressingly uninformed infidel allies on the Left-including, sadly, Jewish Leftists." "Reading David Solway is as great a pleasure as listening to Oscar Petersen jamming up on his piano. Author, essayist, poet, polemicist, raconteur, Solway without failing strikes just about always the right note, pulls the right chord, and delivers the knock-out punch exquisitely. Solway is peerless at his best, and his best is the norm with him as he tears down false messiahs selling cheap goods dolled up as the latest cure for whatever ails man in his endless search for some illusive utopia."